Just heard of a new PYMOL plugin, created by Jared Sampson, called PyMOLProbity which allows a PyMOL user to visualize MolProbity-style structural validation data directly in a PyMOL session. PyMOLProbity is a plugin allows the user to produce MolProbity-style visualization of atomic interactions within a structure (e.g. H-bonds, van der Waals interactions and clashes) directly within a PyMOL session. 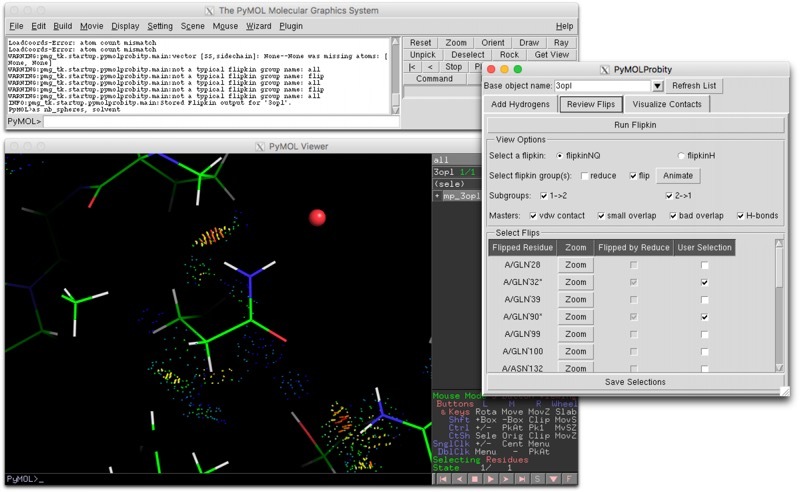 The plugin runs local copies of several executable programs from the Richardson Lab at Duke University, authors of the MolProbity software, parses the output, and displays the results in the PyMOL viewport. There are both a graphical user interface (GUI) for general point-and-click use, and a command-line interface (CLI) suitable for scripting. Chen et al. (2010) MolProbity: all-atom structure validation for macromolecular crystallography. Acta Crystallographica D66:12-21 DOI. The Reduce, Probe, and Prekin executables are only available for Linux and MacOS, PYMOL is available from Schrödinger and also available via Homebrew, you will need to install XQuartz first. There are detailed instructions on how to install a variety of chemistry/cheminfomatics/biology packages on a Mac here.